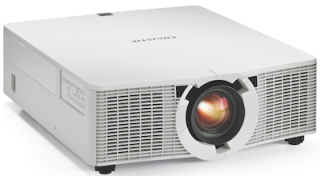 The What: The Christie H Series is a powerful 1-chip DLP projector. The What Else: The Christie H Series projectors feature 12,000 lumens and are the lightest, brightest and smallest projectors available in the 10,000-plus lumen 1DLP category. The projectors handle HD and WUXGA resolutions, feature built-in warping, blending, and color correction, and are very quiet (40dBA). They are compatible with camera-based geometry correction, work with a full suite of lenses, and offer easy integration with 3G SDI, HDBaseT, bottom-side HDMI connectivity, and Crestron and AMX compatibility. The Bottom Line: Weighing only 52.5 pounds (24 kilograms) each, the dual-lamp Christie D12HD-H and Christie D12WU-H are suitable for both mid-to-large rental staging and fixed applications including concert halls, auditoriums, hotels, boardrooms, education, government, conference rooms, and houses of worship.